It is a famous, gentle giant of the African savannah, but the giraffe's genetics have just revealed that there is not one species, but four. Giraffes have previously been recognised to be a single species divided into several sub-species. But this latest study of their DNA suggests that four groups of giraffes have not cross-bred and exchanged genetic material for millions of years. This is a clear indication that they have evolved into distinct species. The study published in the journal Current Biology has rewritten the biology of Earth's tallest mammal. 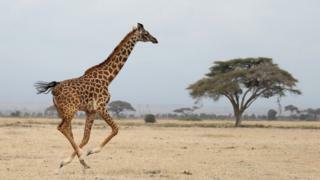 The scientists say their findings could inform the conservation efforts for all four species of giraffe. Conservation was the catalyst for this genetic research; the Giraffe Conservation Foundation asked the team to carry out genetic analysis of giraffes in Namibia. The foundation wanted to understand the genetic differences between different giraffe populations, to see how the animals might be affected if different subspecies were mixed together when animals were moved into protected areas. What we found then, says Axel Janke, a geneticist at the Senckenberg Biodiversity and Climate Research Centre, who led the research, "was that the sub-species were genetically very different and separate. "I'd never seen that in a population study [of a species] before." This initial study examined what is known as mitochondrial DNA - a packet of DNA within every cell's "engine". This is useful for population genetics - it can be easily isolated and contains lots of known variants that can track relatedness. But mitochondrial DNA is not part of the code that builds an animal, so Dr Janke decided to examine and compare parts of that code - the nuclear DNA. "It turned out, he told BBC News, that, for example, "the whole clade of northern giraffes was very different from reticulated giraffes." "Our findings indicated four distinct species." While giraffes had always been thought to be of one species, Dr Janke likened the difference between one species and another - in terms of their genetic code - to that of a Polar bear compared with a brown bear. This suggests that each species is adapted for a specific environment or diet - a question that is the subject of his team's next research project. Matthew Cobb, professor of zoology at the University of Manchester explained that the "four groups of giraffes had "been separated for 1-2 million years, with no evidence of genes being exchanged between them". "This is an important finding that will enable conservation biologists to target their efforts and, perhaps, to come up with new conservation approaches in captivity or in the wild, based on the genetic similarities and differences between these groups," Professor Cobb told BBC News. Media captionMike Jordan from Chester Zoo tells the BBC's Victoria Gill how a surprising discovery about giraffes could impact conservation. Dr Janke commented: "We've clearly completely forgotten what a giraffe is." He added that conservation programmes focused on specific species - understanding an animal's life, behaviour and habitat, to inform how it can be protected in the wild. In the last 15 years, the population of giraffes has declined by 40% - there are now an estimated 90,000 individuals in the wild. But, as a single species, they are classified by the International Union for the Conservation of Nature as of Least Concern. Now, it is clear that each of these four newly classified species could be faring very differently. It's important to raise awareness for conservation, said Dr Janke, "to protect his beautiful animal of which we know so little."